In November 2017, you’ll be able to hold a copy of my book in your hands and enjoy the vicarious experience of transforming an old house. 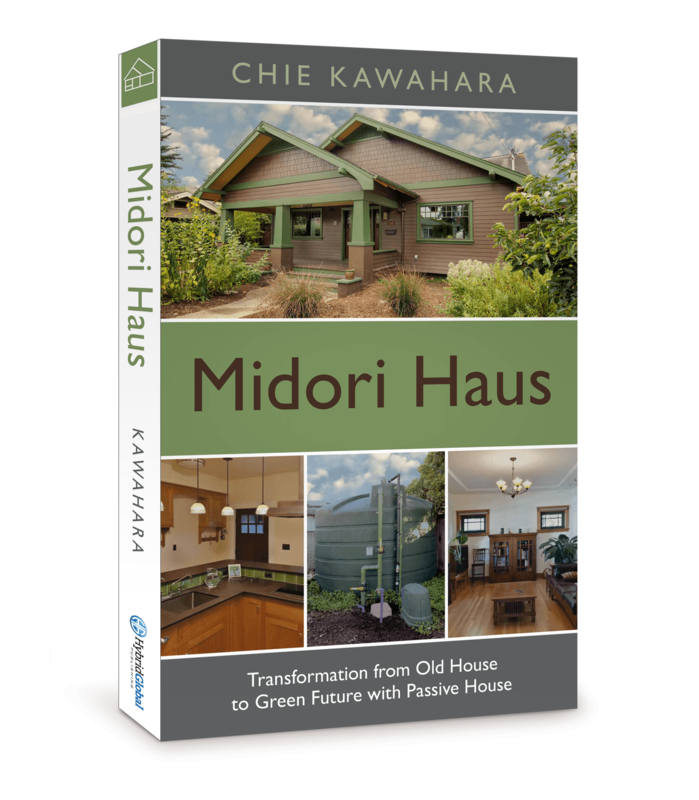 The book is titled, Midori Haus: Transformation from Old House to Green Future with Passive House. Published by Hybrid Global Publishing, it is available in both paperback and e-book. If you’re wondering about how to apply your collection of notes, neat ideas, and file full of green products brochures, you just may find yourself in chapter 3. At that point we were running the risk of creating a house with a hodgepodge of green ideas that may not have worked well together. Fortunately, we found a very good international building standard that looked at the building as a whole. Using the energy efficiency focus as the core of our project, we managed to avoid the green hodgepodge. Did we do everything right? No. At one point we naively thought that we would arrive at a single logical solution if we spoke to enough experts to solve a problem. That was not the case. We stopped construction for months while we wrestled with this issue in chapter 13. We learned the hard lesson—when expert opinions diverge, it’s up to the homeowners (who hold the purse string and who will literally live with the decision) to choose the path. I wrote this book for you. It’s for those of you who want to live in a healthy, comfortable, green home and are gathering ideas for your project. It’s also for architects and contractors who want to share the Passive House standard with their clients. Chie, cannot wait for your book! Can’t wait to get a hold of your book!